Are you also in a dilemma while choosing the best way of investment? Are you confused whether to invest your money in lump sum or in installments? Which way will provide you the better returns? Then you are landed at the right destination. Today, our matter of contention is going to be a SIP or lump sum which one is better? The answer to these questions has been framed in this article which will aware you about the Investment ways i.e. investment in a Lump sum and investment via SIP. Always remember that Good investment decision is not done overnight it requires thorough research and knowledge. Firstly, you must be well acquainted what is a lump sum investment? Let’s take a read at the following! 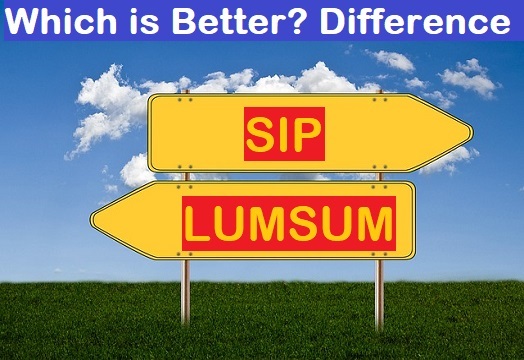 What is the Difference between SIP and lump sum? Who should invest in the lump sum plan? Should I invest in SIP or lump sum? Is SIP better than lump sum in mutual funds? For that, you need to learn what is SIP investment? Is SIP Good investment? To get an answer for this please read further! SIP means an investment which is following a systematic pattern and that is why it is called by the name as ‘Systematic Investment Plan’. This plan offers its investors an opportunity to invest their funds in installments. There is no limit for investment. He/she can start to invest with merely 500/- also. There is no limit on maximum money investment. The investor can take a plan for 1 year or 2 years or for 5 years, wherein he has to deposit some fixed amount of money every month/week/quarterly. It is not necessary that he has to invest monthly only. It is up to his choice that which time interval will be convenient for him/her for doing investment regularly. He can make deposits weekly also and yearly also. Suppose you are an investor of SIP scheme and you are regularly investing 1000Rs monthly in it. Suppose in some month, you don’t have 1000 Rs and you have only 500 Rs to invest, then you can invest just Rs500 also. Even you can skip the investment for that month. What happens in SIP actually is that what you invest in a particular month is carried forward by the professionals of Mutual Fund in the market of stock trades and the returns generated is transferred to your bank account. Suppose you are investing Rs1000 monthly in SIP scheme, then you can enjoy the returns on it in two types. The first type is to take the monthly returns on part of investments. The second option is that you can add the returns with your principal amount and again reinvest it. This will gain you advance capitals in the long run. Let us understand this with help of an example. You have invested 1000Rs in the first month and after completion of the first month, you are provided a 10% return on it. It means that you will earn 100Rs on your 1000Rs investment. But, if you add this earned amount i.e. Rs100 into 1000Rs then your total money will become 1100 and you can use this amount for reinvestment purposes. You will now invest Rs1100 and you will earn 10% return on Rs1100 (not on Rs1000), so this time you will gain Rs110. In this way, you can multiply your returns and in the long run, you can earn a lot of money on your mere deposits. It creates disciple for investment activity. The individual has to invest regularly a certain amount of money. The time-regularity can be according to weekly, or quarterly, or yearly. It does not enforce the individual to pay the amount in lump sum. Even a poor person can invest in trade market via SIP. As investment by the investors is done monthly or quarterly, so this is invested in the market during its declining time and boost time also. Whatever the condition of the market is, in the long run, the SIP investment shows very steady returns. As per the income flow of the investor, he can plan the amount of investment and the duration of investment too. It is very easy to set up and monitor SIPs. After the initial formalities, the amount will be deducted directly from the bank on the specified date. So, it saves the trouble of manual investment. This is suitable for those investors who do not have a steady flow of income and because of that they think of skipping the investment of any particular duration period. One cannot change the amount of already invested money as a result of up and downs in the market. Direct Vs Regular Plan Mutual Fund How to open a Demat Account? Generally, it is seen that most of the people invest their money in a lump sum. Lump sum means your heavy amount of money or a major part of the saved money which is invested altogether. So, major people have the perception in their mind that if they invest their saved money altogether in investment activities then they will get much better returns in the long run. They are absolutely right. Obviously, the one-time large investments for a longer period will definitely provide them a much higher return when they will be withdrawn at their respective maturity periods. Although one could invest lump sum money only when he has a good amount of money with him. In the absence of the fair amount of money, nobody can think of investment in a lump sum. So it is essential that if you are thinking of investing your savings entirely at one go then you first should have a proper money saving, and secondly, you should have a long term plan. The investor has not to worry about depositing money every time on a regular basis with the Fund house. This is a one-time investment which is required to be withdrawn at the time of its maturity only. The returns of investment via Lump Sum plan are generally higher. It is a good option for those who left with a certain good amount of money in their savings account. They can utilize it for investment. Once deposited the money in a lump sum, one becomes out from the headache of managing the investment. It would be just that he has to just take concern after when the maturity period of the investment will arrive. It is much suitable when the investor has some long-term objectives like he would need a good amount of money after 10-12 years when he has to give money for higher education to his children or for marriage purposes. One cannot invest regularly his savings in investment plans of this kind. One cannot withdraw the money deposited in investment before maturity period. For doing so, either he has to pay the tax or in some cases, he or she will be prohibited to do so. This is more prone towards the market risk because the returns, at the end of the maturity period, are not guaranteed to return the high amount. It completely depends on the market decline and boosting phenomenon. So, it may happen that the invested money may end up with the loss. Those who earn fairly every month and left with the fair amount of savings. Those who have the goal to earn an investment for 5 years or some long duration. For those who want to play a safe game in the stock market. Suitable for those who want to play aggressively in the share market and want to enjoy the aggressive returns. So, what could be the best strategy? What gives a better return? The investment via Lump sum money gives you a better return but in the long run only, while the SIP is a hindrance for those who do not have a steady inflow of income. This is really confusing that what to do then? The best strategy is to invest in SIP and the Lump sum in combination. Invest your partial money in SIPs and rest amount should be dispatched in the Lump sum investment. This will surely give a sound weighted average XIRR return over a 3-5 year period. This can be executed only if you have strict discipline, are well informed about the markets and don’t panic. You seriously should not waste your time in analyzing the better option between the Lump sum and the SIP. It’s totally dependent on your income nature of inflow and outflow. If you left with a fair earning after deducting all your expenses, then you should invest in a lump sum plan. But if you want to multiply your little savings then go for SIP. Simple! I am elated to share my knowledge with you! Guys! If you have any doubt in this article or you want to ask any question regarding the trade market or mutual market then please inform us in the comment section given below. We will surely guide you. Like and subscribe us if you like reading the above post. Previous articleDifference Direct Vs Regular Plan Mutual Fund Investment- Which one is better?